Clear with High UV(10) Warning!! It was hb's birthday yesterday. Hb's work mate, Noel, his wife & their granddaughter came to help us out with gardening. We are still in the midst of planting tomatoes and chillies as we have decided to grow our plants in a veggie box instead of planting it in the garden. Our garden has stone pebbles on top of the soil and due to that, our chilli plants died because of the heat from the pebbles. 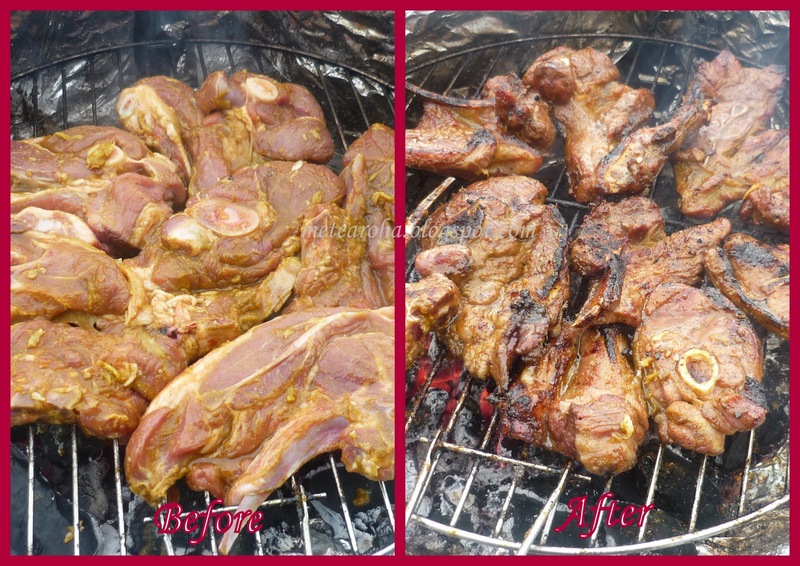 We had BBQ lamb chops, corns and mashed potato for dinner. I used almost 2kg of lamb shoulder chops in this recipe as we have guests. You can reduce or increase the marinate accordingly. Clean lamb and pat dry or just let the access water drip off the chops. Pound garlic and ginger to a paste or u can just chopped them to small pieces. Add all ingredients into a bowl and stir them, then add lamb chops. Recommended to let the chops marinated overnight or a minimum of 2 hours and keep them chill in the fridge prior to bbqing them. Or you can grill them in the oven. For the 'smash' potato-kentang....that's what Jannah calls the mashed potato.....hehehez. She has the tendency of calling things in English & Malay....like banana-pisang, ball-bola and many more. I just boiled the potatoes and add some salt while boiling them. Add a little bit of butter, fresh milk and pepper while mashing them. I used the frozen corn cobs as they are still not in season yet....they should be in season soon, can't wait to eat the fresh ones. Sedikit garam ~~ Salt if required. I added 1 tsp lea & perrins worcestershire sauce instead of salt. 1. Panaskan mentega dalam periuk kemudian tumis bawang besar hingga layu. ~~ Melt butter in a pot and saute onions till soft. 2. Tepung gandum di larutkan dalam air hingga rata kemudian masukkan dalam periuk tumisan tadi. ~~ Stir flour into water until it is diluted and pour into the pot. 3. Masukkan semua bahan lain termasuk sos-sos. Kacau atas api hingga pekat. Boleh di angkat dan dihidangkan. ~~ Add the rest of the ingredient and cook till sauce thickens. Tips from Wana.....u can add button mushrooms and turn this brown sauce to mushroom sauce. Tks for the bday wish, akan sy sampaikan kat hb :) Hb sy ni mmg giler rugby, Mas...hehehez mkn rugby, tidur rugby, mandi rugby....pendek kata kalau perbualan dgn kwn2 semuanya pasal rugby.